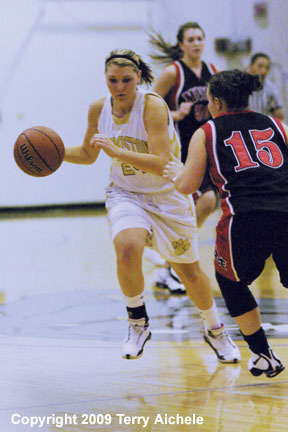 Courtney Walchli, center, of Hermiston is one of several Bulldog defenders against Mountain View on Saturday. HERMISTON - The Hermiston Bulldogs defeated the Mountain View Cougars 59-31 Saturday afternoon January 10, 2009. The Bulldogs conference record is now two wins and one loss. The Hermiston Bulldogs dominated the Mountain View Cougars throughout the game. The score at halftime was Hermiston 32, Mountain View 12. Hermiston outscored Mountain View 15 to 6 in the third period. 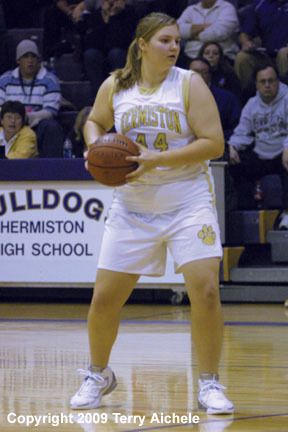 The hot shots for Hermiston in the third were Marie Pedro and Hannah Whitsett both of them hit three pointers and made their foul shots. Hermiston lead at the end of the third 45-18. Hermiston again outscored Mountain View 14 to 13 in the fourth period. Crystal Schmidt, Brooke Davis, Sami Webb, and Marie Pedro all had a good period as Hermiston took the win, 59-31. 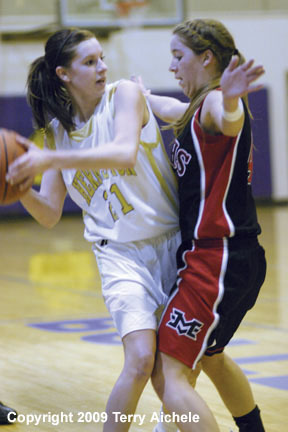 LEFT - Marie Pedro of Hermiston is guarded by Katie Bartholomew of Mountain View. RIGHT - Hermiston's Sami Webb is guarded by Lacy Mayhew of Mountain View. LEFT - Hannah Whitsett of Hermiston is closely guarded by a Mountain View defender. RIGHT - Marie Pedro of Hermiston sets up for a pass. 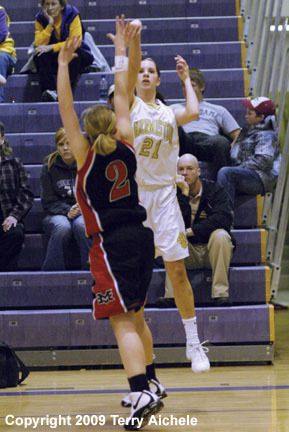 LEFT - Hannah Whitsett of Hermiston attempts a three point shot. RIGHT - Hermiston's Hannah Whitsett drives to the basket while going around Chex Schoenborn of Mountain View.